As we look for new ways to improve building performance in our efforts to reduce energy use and lower greenhouse gas emissions from commercial buildings, we must also recognize that occupant comfort cannot be sacrificed. While people’s attitudes towards indoor comfort are complex and dynamic, building systems are not designed to respond to these needs. A new research collaboration at Berkeley focuses on opportunities to use advanced computing to enable “intelligent” building infrastructure. This has primarily been a partnership among researchers from CED’s Center for the Built Environment (CBE) and the Department of Electrical Engineering and Computer Science (EECS). In just a short time a number of fruitful projects have come out of this collaboration. 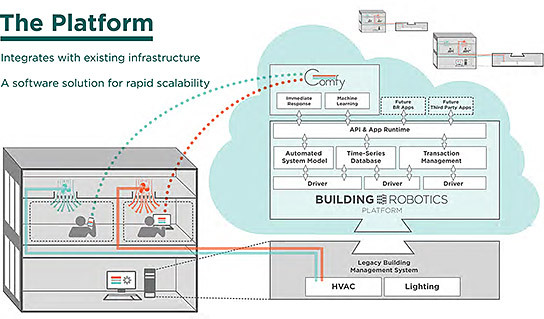 One of these initial projects is sMAP (Simple Measurement and Actuation Profile), an open-source protocol to easily integrate data from different sources in buildings — such as energy and building system operations data — into a uniform and accessible platform. Buildings usually have little data on comfort levels and operational efficiency. 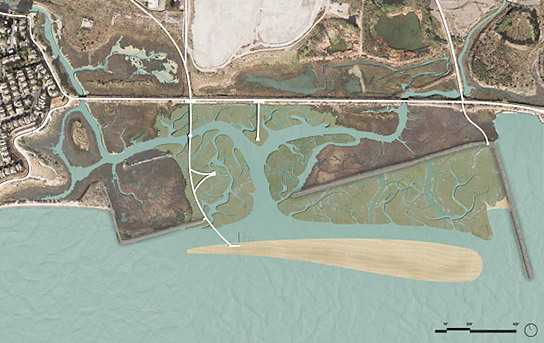 sMAP has helped by creating a method for gathering these data efficiently. The platform has been deployed in buildings across the UC Berkeley campus as well as at Lawrence Berkeley National Laboratory. Based on this work done while they were Ph.D. researchers in computer science at Berkeley’s LoCal Group, Andrew Krioukov (M.S. Computer Science ’13) and Stephen Dawson-Haggerty (Ph.D. Computer Science ’14) developed Comfy, a learning thermostat designed for commercial buildings, and the first product to come out of their Oakland-based startup, Building Robotics. While currently working on my PhD in Building Science at the CED, I also co-lead Building Robotics — along with co-founders Andrew and Stephen, and VP Design & Communications Beau Trincia (M.Arch ’06) — guiding an interdisciplinary team focused on re-inventing building controls with advanced computing and thoughtful user experience. The Comfy software works on the philosophy that is central to CBE: preferences for temperature vary considerably over time, in different climates, and across populations. In other words, there is no “one size fits all” for temperature. Some of CBE’s most current work looks at the related principle of alliesthesia, explained in this recent paper. Currently, buildings are not run dynamically — most buildings typically condition spaces between 70–73 degrees throughout the day. 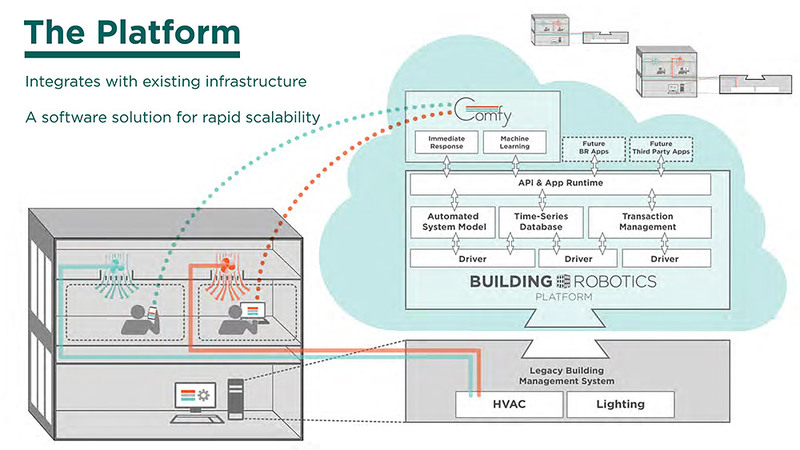 The Comfy software enables dynamic and demand-based conditions, providing both an immediate response from the building (either warm or cool air, temporarily) and machine learning to optimize zone temperatures based on user preferences, time of day, day of the week, and the temperature of the space. When no user feedback is seen, the space is left less conditioned to save energy. The software also provides the ability to control lights in a similar fashion. One interesting aspect of our work is the direct interface between people and the dynamic building space around them. Figure 1 shows the Comfy interface, designed to be more understandable than a typical control. In this way, Comfy has become a wonderful field study in thermal comfort. 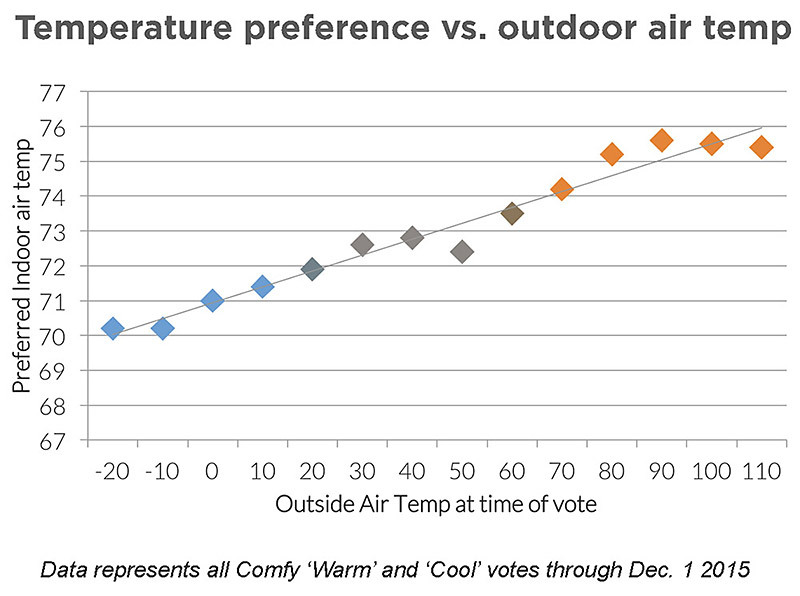 Supporting previous CBE findings, we’ve found that people use Comfy to set temperatures in a far broader range than normal — as cold as 65 degrees and as warm as 80 degrees. 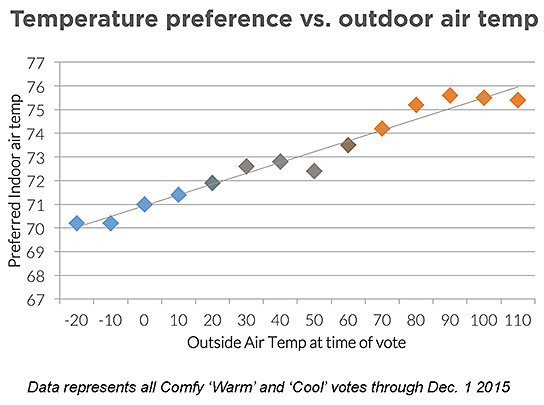 We see seasonal preferences change as well, especially in the summer when many office buildings tend to be over-cooled. As we dress for the summer, so we prefer our work environments to be warmer. 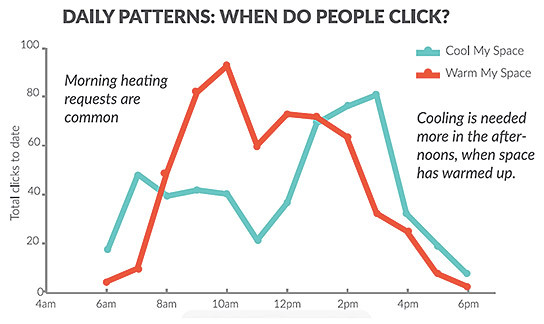 Figures 2 and 3 show our initial data on these issues, showing how people’s temperature preferences can vary significantly more than we may imagine. Importantly, we’ve found a strong persistence over time in the use of the tool, indicating that people build a lasting relationship with the building through this interface. Technologies like Comfy will increasingly redefine how people experience and interact with buildings in the coming years, allowing a much deeper relationship between the human body and the world around us. What other possibilities will this capability allow?  We are looking forward to seeing how this growing field evolves into this new exciting frontier. 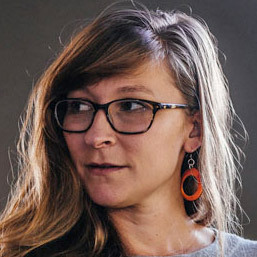 Lindsay Baker (M. S. Arch ’10) is a PhD candidate in Building Science at the CED as well as VP of Business Development at Building Robotics, a software company in Oakland. Prior to that, she worked with Google’s real estate team on sustainability, and at the US Green Building Council developing LEED rating systems. She has served as a writer, convener and consultant in the sustainable buildings industry for over 10 years.